UDM Downloads > iOrgSoft Audio Converter! The best Audio Converter for music fans. iOrgSoft Audio Converter is a powerful and professional tool for video and audio file conversion. Not only convert audio files between MP3, WMA, M4A, MP2, AAC, AC3, AMR, etc, it also helps you extract audio tracks from all types of video files such as AVI, MP4, WMV, 3GP, MOV, VOB, MPG, ASF, RM, RMVB, FLV (Flash), and so forth. 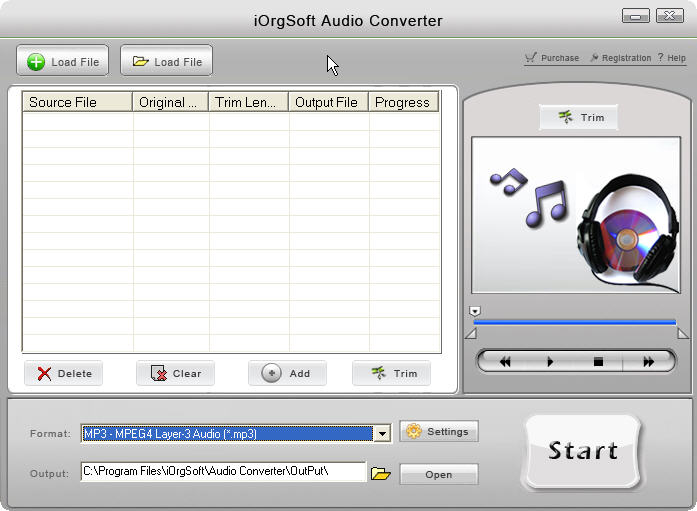 iOrgSoft Audio Converter has a unique feature that lets you trim any audio clip. It also allows you to adjust your favorite audio quality by setting the sample rate, bit rate, audio encoder, channel, and volume. Besides, this Audio Converter enables you to add artist and title tags to audio files. If you want to convert mp3 to wav, convert wav to mp3, convert wma to mp3, and so on, iOrgSoft Audio Converter is exactly what you are looking for. All audio conversion processes such as convert MP4 to MP3, convert M4A to MP3 and AAC to MP3, etc. are very easy to handle with excellent quality! Key Feature: Support converting audio files among any formats. Convert mp3 to wav, Convert mp3 to wma. Convert wav to mp3, Convert wav to wma. Convert wma to wav, Convert wma to mp3. Convert video to MP3, WMA, M4A, MP2, AAC, AC3, AMR. Support audio trim for getting your most favorite audio clip. Customize the settings including sample rate, channel, encoder, and so on. Extremely easy to use with intuitive interface. Fast convert speed with high quality. One-Business-Day email Service for free technical support.